It might sound overdramatic and it will take many years to deconstruct a superpower but as the middle class slowly erodes year by year, you are seeing the foundation exposed for what it is. The peasants realize "something" is wrong the past decade but can't put their finger on it. It appears unlike the late 1920s when "the wrong" was righted by huge change, this time the path we were on... will just continue. 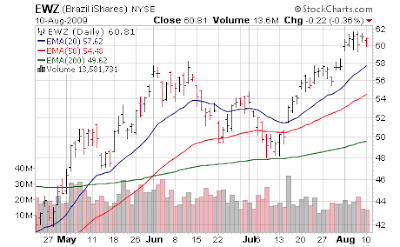 We mentioned a newer ETF which helps get exposure to Brazilian consumers back in early June - an enticing proposition as it is nearly impossible for US investors to easily get exposure to "middle class Brazil". 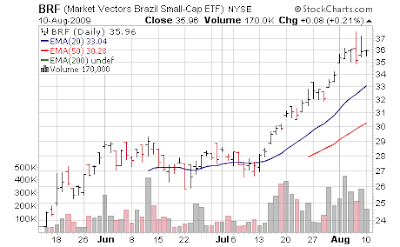 [Jun 2, 2009: Market Vectors Brazil Small Cap (BRF) - a New ETF for Exposure to Brazil]. Unlike iShares Brazil (EWZ) which is nearly 50% allocated to two companies - Petrobras (PBR) and Vale (VALE) [hence I find flawed as a way to get exposure to a country] BRF is very broad. It has performed very well since my piece but again - how much of this is due to "great investment selection" and how much is due to the massively correlated "rising tide lifts all boats" (aka student body trading) that seems to dominate all markets nowadays, is an open question. So at least in the short run, my preference for something more broad based and facing the consumer was superior to buying an ETF that is predominantly 2 companies. This good performance has also created some more interest in the ETF as we are getting a lot of 200K and 300K share days, as opposed to 100K share days a few months ago; the more liquidity the better. Let's keep this one on our radar when the next major correction ensues. Brazil will likely be one of the first countries to emerge from the slump: The economy may grow slightly this year and by as much as 4.5% in 2010, helping lift millions of Brazilians out of poverty. Veteran Brazil watchers say the country's resilience is due to a combination of abundant natural resources, an embrace of globalization after decades of looking inward, and resilient businesspeople and policymakers who have learned to survive difficult times. So as soon as the economy started to contract last year, Brasilia trimmed income taxes and cut levies on key consumer goods, helping manufacturers boost sales and avoid layoffs. Although the economy fell into recession in the first quarter, consumer confidence and spending quickly rebounded owing to the stimulus and sound domestic finances. A comfortable $212 billion cushion of foreign reserves (a foreign concept in the US) and a decade of budget surpluses (an even more foreign concept in the US) have allowed the central bank to slash interest rates to a record low of 8.75% from 13.75% in seven months while pouring liquidity into the market to keep credit flowing. "Brazil's fundamentals are very strong—we don't have any of the problems that created the bubble in the U.S.," says central bank President Henrique Meirelles. Ooooh, 'dem are fighting words. Some interesting statistics here - even as Brazil is viewed in the US as a "commodity" country that essentially is a servant to China and nothing else - it's more than that. Just as important, though, is Brazil's huge domestic market. While outsiders focus on the country's shipments of iron ore, steel, and soy to China, exports are just 12% of Brazil's $1.5 trillion economy. It's the 190 million people and the fast-growing middle class—now more than half the population—that drive growth. In the past seven years a government program called Bolsa Família has helped nudge 24 million Brazilians above the poverty line. And 8 million jobs have been created since 2003, while the minimum wage has increased 45%. Yikes, BusinessWeek might get banned at FOX News after that last bullet point. ;) Minimum wage increases coincident with job creation? Scientifically impossible; this has to be the 7th sign. As always, let's not gloss over the issues - as with China and India, Brazil still has huge tranches of poverty. And similar to India, infrastructure is still a major issue. But when you actually have budget surpluses and positive reserves you can address these issues without stealing from future generations at an ungodly rate. As for corruption? Please, look around you - corruption thrives here just as anywhere else. That's not to say Brazil isn't still a tough place to do business. Its highways, railroads, ports, and electric grid are outdated and congested. The government collects 36% of gross domestic product in taxes, similar to Europe, but delivers Third World services. Political corruption and a nightmarish bureaucracy can hobble growth. And government spending is starting to rise in the runup to next year's elections, which will mark the end of Lula's eight-year presidency. State oil company Petrobras is a case in point. Last year the company discovered vast deepwater reserves that it is developing with a five-year, $174 billion investment program. The goal is to double Brazil's production, to 3.5 million barrels a day, by 2012, making the country a top oil exporter. "Our deepwater discoveries didn't just fall from the sky. They're the product of a very long-term development program going back 30 years," says Petrobras CEO José Sergio Gabrielli de Azevedo. "It's the Brazilian equivalent of sending a man to the moon." Now of course sitting on a huge reservoir of oil is luck of the draw but with or without .... they are not reliant on those potential reserves - or the kindness of others with oil reserves - to subsist. Brazilians are also buying more food, clothing, and household goods. "Over the next five years, we'll see a doubling of sales of durable goods in Brazil," says José Roberto Tambasco, vice-president for operations at Pão de Açúcar. Even hapless General Motors is enjoying fat times in Brazil, where it's investing $1 billion through 2012 to develop a new small car. Whirlpool (WHR), which has a 40% share of Brazil's appliance market, has benefited, too. Sales jumped 20% in May and June compared with a year earlier. Similar to China and India you simply have "modernization" as a simple but powerful secular trend - think the US in the 1950s, 60s. In wealthier cities, 55% of households have a washing machine, but in the poorer Northeast, less than a quarter do. "Think how many washers we can sell in this country," Drummond enthuses. "Washers and microwaves are the new necessities." Many of those goods will be bought with credit cards. Purchases with plastic have been growing 22% a year during the past decade, and since fewer than half of Brazilians have cards, there's immense potential. This speaks to the long term thesis in the duopoly that is Mastercard (MA) and Visa (V). While the US market is saturated - boy oh boy, is is saturated, much of the rest of the world is just being introduced to plastic. Credit to the private sector is just 44% of GDP—up from 36% a year ago—but still well below the U.S. level. As for housing? We own Gafisa (GFA) and have for much of the past 2 years... again, simple modernization and urbanization are going to be powerful drivers. Mortgages, like credit cards are just in their birthing stage the past few years - people in these countries actually have to SAVE to CONSUME. It's like the Dark Ages folks. Brasilia aims to get at least 1 million homes built by 2011 due to initiatives such as My House, My Life, launched in April. That plan "is going to completely transform the housing construction industry in Brazil," says Leonardo Guimarães Corrêa, chief financial officer of MRV, Brazil's largest low-income homebuilder. MRV saw $231 million in home sales in the first quarter and doubled that in the second quarter. It has 200 construction sites nationwide, and its stock price has quadrupled this year. Does Brazil run the risk of a real estate bubble? During the long years of high inflation, mortgages were nonexistent, and today they represent just 2.5% of GDP, vs. 80% in the U.S. So few see much risk of the market overheating anytime soon. " "There's so much pent-up demand," Corrêa says. "It's not like the U.S., where people got up to their ears in debt. We're talking about simple, affordable apartments." And yes, eventually 1 day things will overreach - humans are the same everywhere and excess will pervade: Brazilians will be maxxed out on their credit cards, go to the malls weekly as a social ritual, outsource their production jobs to some "cheap locale" like Peru, and be flipping homes like daytraders. But for the foreseeable future they won't have most of our bad habits; we have a few decades before we have to worry about them behaving like modern Americans. Until then, it's still Ozzie and Harriet habits in much of the developing world - they have much to learn from us.